Free Play Or Structured Activities For 6-Year-Olds: How Do They Learn Best? The snapshot of a 6-year-old is decidedly different from when he was 4 or 5. Their attention spans have increased along with their self-control. They are excited about learning, very active, and wonderfully social and lovable. Six-year-olds have vast vocabularies, especially if they are read to often and engaged in frequent conversations. Like little sponges they absorb what they hear. They enjoy following directions and can remember several instructions at once. Their pronunciation can't be beat and their sentence structure can be quite sophisticated. When they hear a word for the first time they want to know what it means. They also can understand how the same word can have different meanings in different contexts. Six-year-olds count to 200 and understand addition and subtraction. Some do their arithmetic by rote understanding if that is how they are taught. They can memorize rules and carry them out. However, left to their own devices many of these children do math in their minds understanding conceptually how mathematics works. I've seen many astute children of this age add multiple three place numbers without learning the rules of "carrying" numbers. They don't have the mathematical vocabulary to explain what they do, but they visualize in their minds number concepts and solve problems. Why take that away from them by memorizing rules? In schools there is often an emphasis on what is pretend and real. While this is helpful when you awaken from a nightmare, fantasy shouldn't be discouraged in daytime play. By fantasizing different characters with toy figures acting out different stories, imaginations soar while daily problems are acted out and mastered in the imaginary stories created. Lots of written homework with little time for free play is a mistake if you want your child to learn quickly and make discoveries about how to solve problems and manage conflict. Most 6-year-olds are very active and can manipulate their limbs in every which way. They can learn team sports, bike riding, skipping, and jumping and many love gymnastics and activities on a trampoline. The more opportunities they have to play with peers who are more skilled than they are, the quicker they learn to manipulate their bodies. Active parents have active children. Some children are more naturally sedentary and sometimes quite intellectual which increases other skills that they benefit from more than their peers but try not to let it lower their confidence in feeling they are coordinated. Each child is different and needs to be encouraged to have new experiences while there is no judgment of their natural inclinations. Six-year-olds are very capable of understanding people have different points of view. They are increasingly aware of their own and others' emotions. They enjoy sharing and are developing values with regard to fairness. When they are in situations where they are going to meet new people, they will glance at trusted adults to get the feeling from the adult's expressions that it's okay to venture forth and start conversations. They watch how adults interact and take their cues from what they observe. Children can certainly be more social than their parents, but if they see their parents chatting with others, they will follow suit. You don't have to teach 6-year-olds how to be creative, they just need opportunities, such as the provision of art materials, music, and encouragement. They should never be judged or criticized for their productions or told they can do better if they try. They want to try to draw, color, build, dance, and make music. While some have unusual talents, most just enjoy their discoveries. Laurie Hollman, Ph.D. is a psychoanalyst and author of Unlocking Parental Intelligence: Finding Meaning in Your Child's Behaviorr found on Amazon, Barnes & Noble, Familius and wherever books are sold. 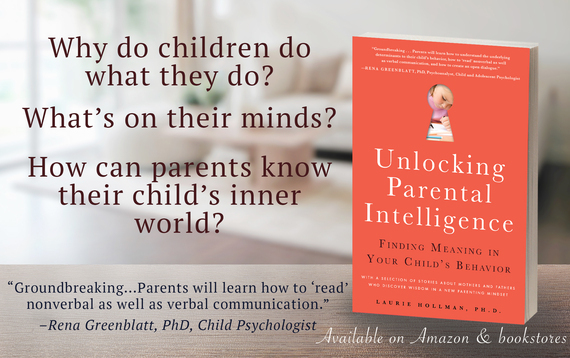 Unlocking Parental Intelligence: Finding Meaning in Your Child's Behavior.